We study pulsed positive discharges in air in a cylindrically symmetric setup with an electrode needle close (about 1 mm) above the top of a dielectric cylindrical rod of 4 mm in diameter mounted at its bottom on a grounded plate electrode. We present ICCD (intensified charge-coupled device) pictures and evaluations of experiments as well as simulations with a fluid discharge model; the simulations use cylindrical symmetry. In the experiments, there is an initial inception cloud phase, where the cylindrical symmetry is maintained, and later a streamer phase, where it is broken spontaneously. At 75-150 mbar, discharges with cylindrical symmetry are not attracted to the dielectric rod, but move away from it. The dielectric rod plays the sole role of an obstacle that shades (in the context of photoionization) a cone-shaped part of the inception cloud; the cone size is determined by the geometry of the setup. 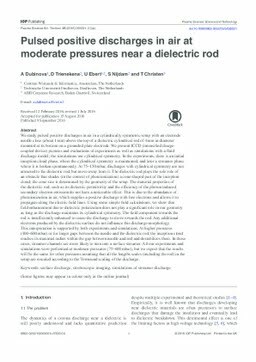 The material properties of the dielectric rod, such as its dielectric permittivity and the efficiency of the photon induced secondary electron emission do not have a noticeable effect. This is due to the abundance of photoionization in air, which supplies a positive discharge with free electrons and allows it to propagate along the electric field lines. Using some simple field calculations, we show that field enhancement due to dielectric polarization does not play a significant role in our geometry as long as the discharge maintains its cylindrical symmetry. The field component towards the rod is insufficiently enhanced to cause the discharge to move towards the rod. Any additional electrons produced by the dielectric surface do not influence this discharge morphology. This interpretation is supported by both experiments and simulations. At higher pressures (400-600 mbar) or for larger gaps between the needle and the dielectric rod, the inception cloud reaches its maximal radius within the gap between needle and rod and destabilizes there. In those cases, streamer channels are more likely to turn into a surface streamer. All our experiments and simulations were performed at moderate pressures (75-600 mbar), but we expect that the results will be the same for other pressures assuming that all the lengths scales (including the rod) in the setup are rescaled according to the Townsend scaling of the discharge.